Blog — Pointing others to HIM! Stepping into my garden, it's easy to overlook one of my treasures. Yes, almost hidden beneath the ground cover of my Wandering Jew plant, a simple stone sets atop the soil. A dear friend, knowing my personal and painful journey, had the simple inscription "JOY" lasered into the surface of that flagstone. She sadly noted that the three-letter word she desperately desired to showcase was difficult to see. Immediately, I thought how fitting that was! Those faint letters are not unlike the invasive vines that have threatened to overtake its presence. And yet, if you set your focus, JOY is easily visible on my cherished garden stone! Indeed, my friends, circumstances can blind us to the true joy that is meant to be ours in Christ...Yes, the so-called ugliness of our lives can distract us from the beauty of a life hidden in Christ. It has been said that beauty is in the eye of the beholder. And when guests visit my home, many have lingered in my garden, but have winced or grimaced at another work of art that I treasure. Yes, should you start up the oak stairs in my little town home or should you head back down those same stairs, your eyes are sure to land on the burlap sculpture of my Savior with a crown of thorns piercing His brow. And like many others, it could be that you, too, will take note that this burlap creation's "gaze" seems to be fixed upon you as you tread my wooden stairway. To some it is horrific and distressing and even frightening. But I am overcome with the joy of that image. No, that wasn't a typo, my friends. And I'll gladly tell you why! Gazing upon that burlap bust of the ONE who freely gave His life for me, I am reminded of three indisputable facts...First, JESUS, the embodiment of JOY, is a picture of a life well spent. Yes, a thorny crown intended to mock Him and inflict horrific pain upon Him was unable to divert Him, for He was worshiping. Yes, He was declaring the worth of His Father to the very end. Next, my JOY abounds and often spills in tears as I behold the One whose eyes beheld me! Emptied of self, yet forever full, He set His gaze beyond His wounds and scars to view the needs of OTHERS. And lastly, throughout my day, and multiple times each day, that work of art reminds me that nails didn't hold my Savior to that cross...Love held Him there! The cruelest of deaths could not imprison Him with anger or bitterness or rage...He was free! Oh, dear one, YOU, too, are free to live and move in JOY...And that's something beautiful to behold!!! As I write these final words, my family is busy counting the days to our annual family vacation! My oldest grandchildren are aware that a pool and a sunny beach await them. As I type, they are preparing for fun in the sun with swimsuits and water shoes and sand buckets in tow! What about you, my friends...What are you "carrying" on your journey? Have the not-so-pretty circumstances of your days blinded you to the beauty of living in joy in spite of everything that's happening around you? Will you live in the readiness and the awareness that the messiness of life is merely a platform--an altar--to showcase Christ? My friends, may we remember that JOY is not our destination on this highway of life, but it should be our "vehicle"--our mode of transportation! I love the creaking sound of my feet as they tap across old pine or oak flooring. Whenever I have the opportunity to peruse an antique shop and sift through shelves of china cups and lace doilies, I imagine the stories that could be told by their long deceased owners. Even as a child I had a love of things from bygone eras. I believe this keen interest came from my dear daddy who always had an appreciation of museums and historical facts. And so, while others my age were bored to tears, an old antebellum mansion to tour or a Presidential library to wander through meant that I was a happy camper. Yes, I recall as a youngster regularly and eagerly visiting the sprawling old multi-leveled home of my beloved friend, Bettie. The pocket doors, cabinetry, and restored wood flooring left me in wide-eyed wonder. For a short time, when I was nine- years-old, my family rented an old two-story house in a small Texas town. Just a hop, skip, and jump down the road was the dairy we had purchased. And most of our evenings and weekends were spent remodeling the house we would soon occupy. Oh, but I remember well climbing the steps to the attic area of that rent house we resided in for a brief time. It was there that I kept my dolls and spent many imaginative hours at play. I pretended to cook and sew and pamper my “babies” for hours on end. I can still smell that attic today. Oh, it wasn’t an offensive smell. Although some might have labeled that attic as musty or unkempt, in my mind’s eye it smelled of logs that once burned in a turn-of-the-century fireplace and the bread that surely was left rising on the stove in the kitchen below those wooden stairs. Oh, yes, either the attic had a distinctive smell or my imagination was incredibly vivid! Whatever the case, even now as I think of those brief months we spent there, I am beckoned to yesterdays long past. Who had lived there decades before us and what had they left behind for future generations? In the nooks and crannies unexplored were forgotten and forsaken treasures tucked out of sight? Beloved friends, that attic’s aroma reminds me of my dear momma’s cedar chest. Now in my fifties, it remains a treat to have it opened. Inside of it, you can still find old photographs and baby clothes that my sister and brother and I wore. And intricate pieces of crochet and embroidered linens set atop folded quilts pieced together by my great grandmother. And yes, an old kerosene lamp can be found nearby that chest. My great grandmother had worked long into the night crocheting, embroidering, and piecing quilts by the light of a kerosene lamp. In my adult years, I read of how the women of yesteryear would sigh when their handiwork was completed and say, “It smells of the lamp!” Yes, the labor of their hands was marked by the aroma of the kerosene lamp that had illumined their efforts. "Lord fill them will your power"
We stood in line preparing to embark on what some might call a "thrill ride"! Numerous small and numbered cars awaited the brave or foolish souls--completely dependent upon your perspective--who would dare to climb aboard and travel at breakneck speeds. With a bit of apprehension, my husband and I paid the posted fee and plopped down in the oh-so-tiny space. Of course, I immediately, and without any needed coaxing, strapped myself securely to the tattered seat. And then, I braced myself for a ride unlike any I had experienced before that moment. You can rest assured that with a white-knuckle grasp I gripped the seat in front of me. And in between the small shrieks of fear I managed to utter, I was overtaken by the feeling that my morning's breakfast could at any moment be hurled through the air. No, I wasn't at SIX FLAGS OVER TEXAS...And no, I wasn't at DISNEYLAND. Instead, this thrilling ride was inside a taxi cab in Costa Maya, Mexico! My husband responded with his trademark laugh--a cackling sound that never failed to capture the attention of all within earshot. On the other hand, I wavered between keeping my eyes tightly shut or keeping them wide open. Of course, the moments my eyes were wide open left me frustrated, since my driver--who must have secretly carried a desire to race at the Indianapolis 500--whizzed past all the sights! Yes, I hardly knew what I was missing, because the scenery zooming past my window was little more than a blur. Suddenly, our very pleasant and uncommunicative driver slowed the cab to a crawl, hung his head out the window, and pointed toward the ground to a rope that was large in circumference and spread across the road. He uttered to us one of the few phrases he knew in English--"Awwww, Mexican speed bumps!" Never had I been so happy to see a speed bump! From that moment on, in a steady succession, Mexican speed bumps appeared...And it was then that everything around me came into clear view! Later, when I reflected on that moment, I realized the unveiling of an unlikely lesson in an unlikely place. Yes, the truth is that as I attempt to whiz past the challenging circumstances in my life, I desperately need to be slowed down...I need to pause and reflect and be pointed back repeatedly to the ONE who has hemmed me in behind and before. Like those Mexican speed bumps, He is there smack dab in the middle of my life. My friends, there isn't a place where He isn't already waiting and wooing me--ever beckoning me to come into His Holy Presence, take my shoes off, and "sit a spell." And I hear echoes of what the psalmist beautifully and confidently declared, "Where can I go from Your Spirit? Where can I flee from Your Presence? If I go up to the heavens, You are there; if I make my bed in the depths, You are there. If I rise on the wings of the dawn, if I settle on the far side of the sea, even there Your hand will guide me, Your right hand will hold me fast..."
Indeed, our gracious God--who has drawn us into intimate fellowship with Himself--invites each of us to embrace the "speed bumps" along the way that we might delight in His omnipresence. Yes, "omni" meaning "everywhere" and "presence" actually meaning something you may not have considered, for it quite literally means "face"! Ohhh, friend, picture your Heavenly Father turning His face toward you at all times! How thankful I will ever be for that glorious day in Mexico when God provided me with an unlikely lesson in a unlikely place--the back seat of a taxi cab! Just as He beckoned me then, HE is beckoning each of us to slow down, let the dust clear, and accept His ongoing invitation. After all, we have His complete attention, for He is ever directing all that He is toward us! Will you join me today in praising our God for His omnipresence? 'Twas six days before Christmas. And not a creature was stirring--not even a mouse! No rustle of wrapping paper could be heard...No revving of my car's engine taking me hither and yon to celebrate with family and friends...No heavenly scents of billowy divinity or other baked-from-scratch-delectables wafting from from my kitchen. But instead, the sounds of the flu hung heavy in my home--with hacking and coughing and the shuffling of my feet from my bed to my favorite chair for fourteen long days. And as I peered through the windows of my French doors to my backyard--my favorite spot, my little Garden of Eden--the picture before me was a window to my soul. I gazed at the mounds of once green and thriving flora that lay limp, lifeless, and shriveled. The crepe myrtles lining my flowerbeds just a few months earlier had daily showered my flagstone patio with endless crimson blossoms. And now, they stood before me naked, vulnerable, and uninviting. The mirror on the wall nearby, and the reflection gazing back at me, seemed to reflect that same image. And it wasnt a pretty sight. But in that moment, I thought of you, my dear, fellow-struggling sisters. And echoes of truth stirred in my bone-tired spirit. I've heard your questions...You want to know what happens in those times when your life lies dormant--those "in between" times...What happens when the winter of your soul seems to have robbed you of the hope that life will indeed spring forth again? Yes, sisters, we all need to know in the depths of our weary beings how to more than survive God's "waiting room"...We need to know how to flourish there. No, this wasn't my first rodeo. And I am confident it's not yours. So, how do we take the lessons from past wintry seasons of pain and frustration and doubt and disappointment--and how do we rest in the knowledge that this "pause" in life-as-we-had-hoped holds the promise of more? We need to know as we wait that there is indeed hope for abundant life--renewed, restorative, and purposeful life. And so, squirming and shifting uncomfortably in God's waiting room, how can we learn to wait well? First, gazing back at my garden, I found an important clue in those brown and lifeless mounds of perennials and stark crepe mrytles. With no striving against the process, my hostas and coneflowers and lantanas lay surrendered to the pause of winter...And so must we! How often we find ourselves scanning the horizon--pleading with God--for the end of our winter of discontent! What if we instead rested in our greatest need---Jesus?! Planting ourselves deeper in the rich soil of His truth, what if we lived in a greater awareness that He won't let us miss our needed answer? Oh, but how tragic if we missed getting more of Him! And then, my eyes landed on the numerous rose bushes throughout my garden. Few leaves remained, but the thorns were still plentiful. Soon it will be necessary to trim back those branches, and I'm sure to have an up close and personal encounter with those thorns. Yes, there will be some pain and some grimacing, but each time I choose to embrace the pruning process, I can see through eyes of faith the promise of bushes laden with countless buds that will blossom with new and vibrant flowers. Oh, my friends, what if we dared to fully embrace this pause--this time in God's waiting room--knowing that the Vinekeeper is never closer to the vine than when HE is pruning it?! Lastly, as the wind howled and the sun was hidden, I found myself wishing for winter to pass and for the busyness of my normal days to resume. I pictured my precious grandchildren in my garden blowing bubbles and feeding the birds. And I chuckled as I remembered the numerous times one of them stepped out of sight and no sound of their chattering and singing and bickering with their cousins could be heard. And as any parent or grandparent knows, often a quiet toddler is sure to be "up to no good"! But will we let the truth grow deeper in our often quivering hearts--the truth that when God seems silent, He is must assuredly "up to only good"?! Yes, time in His waiting room is never a waste of time, dear sisters, for He is busy in this time of pause readying us to receive His promise. And so, dear ones, the flu has passed and the calendar on my wall still signals winter is at hand, but my soul has been refreshed. Undoubtedly, we will each find ourselves seated in God's waiting room time and time again. And yet, if we will attune our weary hearts to hear His voice, His message will be clear..."Blessed is she who has believed that the Lord would fulfill His promises to her!" Even the Von Trapps singing in the background and THE SOUND OF MUSIC playing on the screen of our television, couldn't distract me from the ever intensifying labor pains. They took my breath away, but soon a little 6-pound, 3 1/2-ounce baby boy would more than take my breath away and forever capture my heart. Yes, my dear son, it was a Sunday evening, and I knew I would likely be holding you in my arms by the next day. I can still hear Maria, alongside the Von Trapps, singing in the background about some of her favorite things. And so it is that December 3, 1979 ranks high atop my list of "my favorite things"! So helpless & tiny, I marveled, for you needed me in every way! To feed & clothe you was my delight! I showered your rounded cheeks with kisses & whispered, "I love you, my son!" And little by little you'd leave my side for other things to see & do. You had passed the toddler years to wear a new label. From your first job & first car, you were graduation bound! So, as I leave you in His able hands, please know I'll love you till the day I die! Happy birthday, Kaleb. Thirty-seven years have passed. You and your lovely wife--my bonus daughter--now have four sons of your own! I celebrate the gift of motherhood, of Gi-Gi-hood...Oh, yes, I celebrate YOU, dear son! This is a tale of a woman who loves Christmas. This is my tale. It's not a tall tale, but a heartfelt tale. And it's a tale that's meant to be lived 365 (or 366!) days a year. And yet, it's a tale that holds the possibility of alienating me from you. Oh, but will you dare to catch a glimpse of my heart? Will you stick with me to the final paragraph, dear friend? I pray so. It was a chilly October evening when I arrived in the small town of Virden, Illinois. Yes, so small it boasted no Walmart Supercenter or familiar grocery store chain. Corn and soybean fields aplenty were on full display and lined every roadway inside and outside the city limits. Yes, set against a backdrop of rich farming soil and big barns and silos--handed down from past generations--was the thriving brick church where your daddy served as both the worship pastor and the youth pastor. Your momma, great with child, (yes, that was you, Lucy) continued to toot her flute, sing, and/or tickle the ivories of the baby grand piano weekly. Your Gi-Gi arrived a couple of days before you made your grand entrance, so that I could get the charming little house you would soon occupy--with its usual Midwestern basement--spit and polished. (No, Lucy, I didn't actually spit on your furniture...It's just an expression!) And when all the cleaning had been completed, it was Halloween. As your mom and dad relaxed, I greeted costumed children from near and far with handfuls of candy and a smile. And while your Gi-Gi was not dressed in a costume, my short and spiked hairdo entertained more than a few trick or treaters on that October evening! Yep, Lucy, many thought your Gi-Gi was a rock star!! (Go ahead and laugh, Lucy...You always do!) Awww, but finally the porch light was turned off and between nervousness and exhaustion, a silent hush fell over that little cottage. Bright and early the next morning, we braved the frosty fall air to make the hour long trek to Springfield for your mom's scheduled c-section. We were anxious to meet the darling little girl who had situated herself in a nice comfy position with her head upward--so that her ears would be ever close to the beat of her mommy's heart (yes, dear Lucy, that was you). I paced the waiting room and repeatedly checked my phone for texts of promised pictures from your daddy. And then, at 11:55am on November 1, 2007, I heard the familiar strains of BRAHM'S LULLABY waft through the hospital intercom! You had arrived weighing just over eight pounds! I rejoiced as those promised pictures indeed flooded my phone from your precious daddy!! A few hours later, when you were settled with your mom and dad in your hospital room, I walked in and heard you crying. I like to believe that you were telling your mom and dad--in no uncertain terms--that it was time to meet your Gi-Gi! And so, I scooped you up and sang to you our little song--my version of a song my dear pastor's wife has sung to her babies..."I like your eyes...I like your ears...I like your nose--your hands, your feet, your toes. I like your smile...I really do. There's no one else exactly like you. You could search the whole world and never find...Cause there's no one else...There's no one else exactly like you!" And yes, Lucy, you looked up at me and a sacred and beautiful hush fell across your face. And that was the day that Lucy Shea Toller came to live with a mommy and daddy who had prayed over and over and over for a baby of their own. And that was the day that Paula Rutherford first became a Gi-Gi...And nothing has ever been the same! Dear friends, why does Lucy never tire of hearing that story? It's because she loves hearing how she fits into her family. She loves hearing how she was the longing realized by her mommy and daddy. She loves hearing that she was wanted--that she was, and is, a big deal to us! Yes, the same is true for each of us. We want to know how we fit into God's family. We need desperately to understand how He longs for joyous fellowship with us and that we were HIS big idea! Oh, but we will never fully know that truth until we take God at His Word--until we take to heart the words of His His love letter to each of us. Yes, He has told us His story...It's a story that includes you and me! Just as I have sung that same song to Lucy, and each of my grandchildren after her, more times than I can count--God is singing His song to you and to me. My friend, I invite you to hear it anew right now---"The Lord your God is with you, He is mighty to save, He will take great delight in you, He will quiet you with His love, He will rejoice over you with singing." Now that's a story worth telling again and again! I still chuckle when I recall the day that my sister told me she wanted to raise sheep---cute and fluffy and frolicking sheep! A few months into her venture as a shepherdess, she had discovered that those descriptions should be replaced by--or certainly include--stubborn, prone to wander, and yes, a bit dumb! It seemed that time and time again she had to rescue a wandering lamb or quickly turn over a sheep struggling on his back. Indeed, she had discovered that the cute little flock she had envisioned running and jumping merrily through her green pastureland could not be left to their own devices! 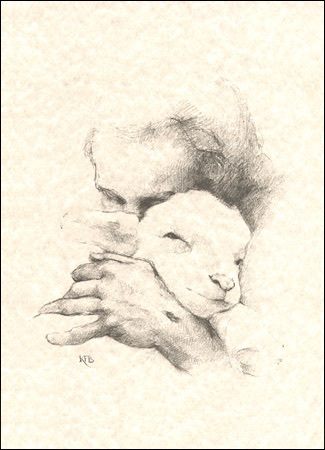 Is it little wonder that our Lord painted the perfect word picture for humans in the form of sheep? I think not! That through Him, I can have a taste of heaven on earth! A fluffy and lacy white ball gown with a cascading train, opera length gloves, a pearl and crystal encrusted tiara, an aisle of multiple tulle and vine-wrapped archways, urns of candles and flowers—these are just a few of the things that I envisioned for my only daughter’s wedding day. Yes, these are the things I labored over to create a beautiful ceremony. And after a few months of planning on paper, I rolled up my sleeves and worked for one week to transform the church sanctuary into a fantasy land. But the truth is that I had labored on my knees for nineteen years for something far more important…My true “work” had been praying for a groom who would love my daughter as Christ loved the church. And as she walked down the aisle on that November afternoon to the strains of how beautiful is the body of Christ, I watched the eyes of her groom in anticipation of his bride, and I knew that God had heard my prayers! Can you picture a young man who has picked out the woman of his dreams? Well, in ancient Israel, the man would prepare a contract to take to the home of the young lady he had picked. Yes, he would include in this the bride price—the money he would pay to the gal’s father in exchange for permission to marry her. This would be quite high. After all, the family must be compensated for the cost of raising this young woman and also the young man wanted to demonstrate his love for her! Oh, but you, the bride of Christ, have also been bought with a price! You see, our groom—our Jesus—came to our house…Yes, He came to earth and presented His marriage contract. Ladies, He paid for YOU with His very life. Each time you take the Lord’s Supper you are remembering that “this is my body given for you…” (Luke 22:20). Well, dear ones, let’s continue to paint a picture of God’s plan through the Jewish wedding ceremony. Next, if the young woman’s earthly father agreed to the bride price offered, the young man would pour a glass of wine. As soon as the young woman drank from the cup, she became betrothed—or what we call today engaged. Does this remind you of anything? Oh, the beauty of the night Jesus poured wine for His disciples and said, “Drink from it, all of you. This is the blood of the covenant, which is poured out for many for the forgiveness of sins…” (see Matthew 26:28-29). Today, we celebrate the engagement of a couple with dinner parties and wedding showers, as the couple spends hours together awaiting their wedding day. And sadly, sometimes, couples today end their engagement with nothing more than a few tears shed. Oh, but the Jewish practice was far different! Once betrothed, the couple was legally bound and a divorce had to take place to end a betrothal. It is also interesting to note that a betrothed couple parted ways for one to two years. That’s right—they did not see each other at all during this time! The young man would go to his father’s house to prepare a special room for his bride. This place was always built on his father’s property or as an addition to his father’s house. And the young woman went her way to begin working on her beautiful wedding garment. She purchased cosmetics to make herself beautiful for her bridegroom. She did not know when her groom would come for her. In fact, the groom did not know when he would come for his bride. Only the groom’s father knew when the time was right for him to take his bride home! However, before the young man and young woman parted ways, the man would present his future bride with special gifts to remind her of him. Please don’t let the spiritual significance of all this slip past you, ladies! Yes, our Savior has gone ahead to prepare a place for us (see John 14). We do not know when HE will come back for us. In fact, Scripture tells us, “No one knows about the day or the hour…but only the Father. Be on guard! Be alert!” (see Mark 13:32-33). However, as we await His return, our Savior has not left us without a special gift… “But the Counselor, the Holy Spirit, whom the Father will send in my name, will teach you all things…” (see John 14:26). Each time I replay the video of my daughter’s wedding or open the upstairs closet to the large bag that encases her beautiful wedding gown, I am reminded that my Heavenly Groom is coming for me! Let me close with one of my favorite stories that reminds me of this truth…Yes, it takes place at The Shepherd’s Home---a special home for children and teenagers with Down’s Syndrome. It seems that this place has a maintenance problem. You see, as hard they try, the janitors cannot keep the windows in this home clean…They are ever dirty. Why? Well, the youngsters have been told about Jesus from the moment they came to live there…And their noses are ever pressed against the glass in anticipation of His return! Ahhhhhhh, the beauty of simple faith…Will the Savior find you—His bride—waiting and longing and living for Him and His return?! I pray so! There are giants in the land! And they are big and tall and terrible giants. Some are so conspicuous they can be seen by the naked eye. They are almost tangible to trembling human hands. And it's true that before they round the corner you can catch a whiff of the the foul scent of their wickedness. And to attuned ears, even their tipped toed advances are heard. Oh, but other giants are concealed...Yes, they are cleverly disguised. In their masquerades they cover over pride and greed and lust and power and countless other lures. Indeed, there have always been giants in our land--in our towns--in our backyards--in our lives! King David knew a thing or two about giants. Indeed, he had seen his share of them. And yes, he had a slain a few along the way. As a young shepherd boy he had killed a lion and a bear. You might say it was necessary training for a future "giant slayer"! As a teenager he faced a giant of a man named Goliath. A walking arsenal was this Goliath who stood over nine feet tall and carried 200 pounds of armor. But on the day David faced this behemoth-sized foe, there was a greater giant that stared him in the face...Yes, David faced a giant of paralyzing fear standing in the ranks of the army of his beloved Israel. And yet, resisting the jealous taunts from those nearest and dearest to him, David stepped past their cowering fear clothed in his simple shepherd's tunic. Israel's King Saul tried his best to outfit the small and unprotected frame of this shepherd boy in his personal military armor. Ahhhh, but the truth is this--you can't fight giants in just any ol' armor. And so, David laid Saul's armor aside and wrapped himself in the power of God's mighty Spirit. It's true that the colossal Goliath fell on that day..And alongside him toppled the gargantuan giant of fear. But in the years that followed, meaner and uglier giants pursued David. By thirty, he had traded his simple shepherd's tunic for the royal and ornamental robe of a king. And with the change of clothing came giants of pride and lust and deceit that knocked much closer than the guarded palace doors. They pounded on the unguarded door to David's heart, and he answered clothed in the vestiges of this earth's power and position. David's failures were grievous. He took the wife of another man and sentenced that man to a sure and certain death--- sending him to the front lines of a brutal battle. Yes, David had forgotten that you can't fight giants in just any ol' armor. Oh, but David, with a heart broken by his sin, returned to God. His grievous failures led him to humble dependence upon God's mighty power. And so, King David, knowing he was but a sheep prone to wander, would be clothed anew again and again in the only true armor adequate to face the countless other giants in his lifetime. Running....Well, I've often said that if you see me running it's likely that there's a snake chasing me! The truth is I am not a runner. In fact, I really hate to exercise. There, I said it! And honesty is good for the soul, right?! But, I have seen, and experienced, a great need in the body of Christ. What is that need? I believe there is a need for us to be marathon-running-kind-of-friends. There is a need to bear with one another through pain and heartache and difficulties until we get to the other side of challenging circumstances. Sadly, few are willing to suffer through the struggles of others if they last longer than a very brief time frame. We have very little patience for struggles that aren't easy fixes. But doesn't our Savior patiently lead us and guide us and bear with us--ever desiring that we see His truth? Yes, He does! And He has called us, fueled by the recognition of His undeserved grace and love, to do likewise. What a privilege! Through spring & summer & autumn & winter-- as long as each season endures! My dear ones, I know many of you are weary from the battles you are facing. I also know that true friendship is a rare commodity. Oh, isn't it high time that the body of Christ rise up to run a different kind of marathon--a persevering-faith-kind-of-marathon? Our Lord Himself will heal any "blisters" we incur along the way. And we will find ourselves passing the baton off to others as we cross the finish line of our faith in unity and victory...To God be the glory! Ready, get set, run! "How does one become a butterfly? You must want to fly so much that you are willing to give up being a caterpillar." Step by step, memory by memory, I rise up and become free! And so, dear ones, I go back often to these words....Standing in an auditorium filled with over a thousand other ladies last February, I was reminded anew of the passion inside of me. Yes, as long as I have breath my battle cry will be, "Until all are free!" So my ears are attuned, my hands are reaching, my feet are ready, and my voice cries to all within shouting distance--" If you could see the woman God has created you to be, you would rise up and never be the same!" Let the chains fall! Yes, Lord, No Matter What! Pulling into what had been destined to be our residential area, the large Allied moving van made its way to the small house we would call home...Yes, it was over two decades ago when the driver parked on the curb and grimaced at the steep driveway that led to the entry of our humble abode. I wasn't sure why he seemed so irritated, but walking inside, this fella shook his head and grumbled, "So you think you are going to fit all of that furniture into this small house?!" Little did he know that I had earned a third-degree black belt in decorating and arranging furniture! And yes, little did he know that the woman who stood before him was suffering from a broken heart. I did my best to maintain a contented and enthusiastic facade. I carefully camouflaged the gaping wounds that were deep inside my soul--ever threatening to burst open at a mere moment's notice. Yes, I had left a spacious home in a hilly, wooded, and picturesque neighborhood in California, but more than that--I had left my heart--not in San Francisco--but in another portion of that golden state. Ahhhhh, yes, the work before me would manage to occupy my wandering thoughts for awhile. Who doesn't love a good story? Not only do I love HEARING a good story, but I also LOVE capturing the attention of an audience that is all ears with an engaging tale. So, grab a cup of piping hot coffee, set back, and listen as I recall the particulars of one of my favorite stories!! © PaulaRutherford.org. All rights reserved.